Sew-in hair styles are a unique way to express your since of style. You may have a since of style where you want to have your hair flow free and grace your face with elegance as the beautiful young lady in these photos. You know how we sometimes like to swing our hair as we strut the runways, walkways, hallways, or what ever ways you strut. Lol. Well ladies step out in style with a Styles by Arica Hart. Rock your style all day and night while protecting your hair underneath. Just because you want to give your hair a break; doesn't mean, you have to look any kind of way. Yes, be the Queen you were designed to be. 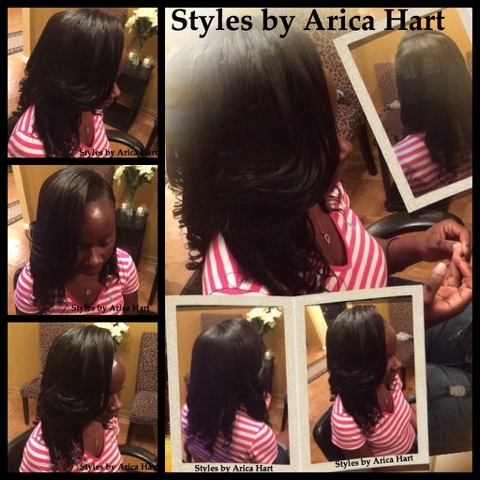 Take charge of your life and get you a hair Styles by Arica Hart. Have a blessed and wonderful day! !